When on hCG diet the 500 calorie diet is the maximum amount of calories your body is to take in order for the human chorionic gonadotropin to function within your body. If for any reason you fail to this 500 calories day's restrictions you put in great risk your daily average weight loss of at least 1 pound per day. The way this hCG oral sublingual treatment works is precise as Dr. Simeon's protocol but with a the variation that we don't use hCG shots or hCG injections at all. Instead, we use the oral 4 drops equivalent to 0.22 cc applications of the AE-27 serum mix together with the hCG powder you buy online. The absorption power of the tongue can not be neglected and it happens in less than 5 minutes. The concentration of the hormone is still high for your body basic's needs. We have abundant proven results and testimonials of the powerful AE-27 serum effects and for the final outcome of weight loss reduction and fat burn of the 500 calorie diet therapy as a whole. Although the 500 calories per day diet is clearly explained within Dr. Simeon's manuscript we are going to outline here the basics of the 500 calorie diet deal. To make your HCG 500 calories diet plan easier we provide the food list inventory and the hCG diet step by step guidelines you will want to get here! Everything start with your food preparation for proteins. 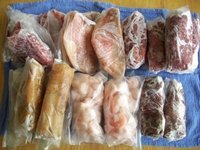 You should make a grocery list to buy your chicken, turkey, fish, shrimp or cow meat and weight it raw, pulling away all visible fat. On the digital diet scale you will precisely measure up the chicken in 6 oz., turkey in 3 ½ oz., fish in 4 oz., shrimp in 6 oz. and all red meat in 3 ½ oz. We recommend to bag them all for easy handling and management while you are on the 500 calories diet and there is a strong reason for that. For the cooking it is recommended to boil it, steam it or grilled while season them to taste. No any kind of oil need to be used. If you add it you will suffer the weight loss consequences! Being done this, you will have ready the proteins intake necessary for your lunch and dinner which you should program accordingly for your desired variations. It is recommended to alternate the bird meat and the sea meat on one day and then, the sea meat with the red meat, finally the birds meat with the red meat as well. You should prepare the alternation program in advance for the whole week, for two weeks or for the 21 day diet period as a whole. Important to note here is that 2 items should not be repeated per the day! Neither the failure of no taking one should be added to the value of the next day. Having done this food alternation preparation you will understand you have already separated the remainder proteins. From lowest 128 calories for the 4 oz. 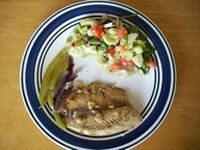 of fish, to the highest 186 calories for the 6 oz. chicken, all under the 500 calorie diet requirements per day. Those amounts should be subtracted from the allowed 500 calorie diet per the day. This protein intake should be roughly the minimum and the maximum. Now, it comes the hardest part. You could also have a small snack between meals which could be a fruit or bread toast (Melba toast or Grissino) - whichever is available for you. Those calories should be subtracted as well. As there only 2 meals to take - lunch and dinner - per the 500 calories diet you are allowed 1 toast and one fruit only, for the whole day. You can take a fruit after lunch and a Melba toast after dinner or the other way. However, both should not be repeated the same day. One easy way to handle the 500 calories diet is dividing it between 2. That is 250 calories per food session time per day. You must read the calories value of any fruit you take and subtract it from the approximately 250 calories per food service time. This will make easier for you to use your brain mathematics while keeping control on all the food you take. This way you will maintain precisely the 500 calorie day diet restrictions and secure the success on the overall weight loss program. Now comes the really, really hardest part of the 500 calorie diet. This is to measure up the amount of vegetables we are to take as the allowed variety is more than 40. If you are to be using the hCG oral sublingual therapy diet for weight loss, there is no problem with vegetable mixing as long as you keep control of your 500 calories day count. Although by our oral hCG sublingual system we have experienced the easy use of any variation of vegetable mix to be added to the protein on every food session. Any one like variations to please senses and to handle the 500 calorie diet his own way, right? And that's precisely where it lies one of the advantages on using oral sublingual treatment against hCG injections. Let's say per the lunch food session your protein is fish. You will subtracts from 250 the equivalent calories of the 4 oz. of fish which is 128. The remaining calories count is 122 calories. You will take this 122 calories and divide them by 3 and will give you a remaining 40.7 calories per each of the 3 vegetables you are interested to mix. Then, you will select any vegetable. You will divide 40.7 by the vegetable type calorie count per the ounce. Let's say you select red radishes. Red radishes have 5 calories per the ounce. 40.7 divided by 5 comes about 8 ounces. You should then measure 8 ounces of red radishes right away. Next, you select cabbage, have 7 calories per the ounce. 40.7 divided by 7 comes about 6 ounces. You should then measure 6 ounces of cabbage too. Finally, you select cucumbers, have 3 calories per the ounce. 40.7 divided by 3 comes about 14 ounces. You should then measure 14 ounces of cabbage. As you can see, now you will have a vegetable mix with nice colors green and red. Cabbage, cucumbers and red radishes should be your vegetable mix for your today's lunch. At this moment you already accomplished the half of the 500 calories per day diet which keep you within the program restrictions. Now let's prepare the dinner time. Now you decide per the dinner food session your protein is flat iron steak meat with 23 calories per the ounce. Then 3 ½ oz. is equivalent to 130 calorie count. 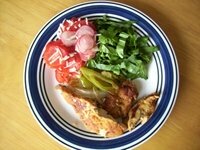 Subtracts this from 250 calories for this dinner food session and your remaining is 120 calories. You still need a vegetable mix variety right? OK! Let's take 4 veggies this time to make better for your taste. We are going to use onions with 12 calories, spinach with 7 calories, tomatoes with 5 calories and lettuce with 4 calories per the ounce. 120 calories divided by 4 will give you 30 calories to each vegetable. Then, take onions 30 calories divided by 12 you got 2 ½ oz. and then, spinach 30 calories divided by 7 you got 4.3 oz. Now, tomatoes, 30 divided by 5 you got 6 oz. and, finally lettuce 30 calories divided by 4 you got 7 ½ oz. There you have your suitable vegetable mix with colors and quantities. Now you should weight 2 ½ oz. of onions, 4.3 oz. spinach, 6 oz. tomatoes and 7 ½ oz. of lettuce. Isn't it very simple? Well, I guess it is not for everybody to spend the time doing mathematics when you hungry. For the 500 calorie diet...Everybody needs something much, much easier! Guess what? We have it! Yes! We have completely done and synthesized all this crazy 500 calorie diet food and ounces calculations which are time consuming to everyone. My recommendation is stick to the hCG diet discipline, follow the instructions and get away from this calorie diet problems! To make it easier for you, much better order your hCG Diet Recipes Book which have hundred of simplified proteins and mixing vegetable instructions already done for your 500 calorie diet count.